Flattened circle measured 99 feet in diameter. Inner ring was 82 feet in diameter. Outer ring was 108 feet in diameter. Ring widths varied from 1.5 to 3 feet. Backward “F” was 65.5 feet long. “Antenna” was 55 feet long. The “corner angle” near the top of the image is a major part of the geometry. Measurements by Ted Robertson, Jeff Wilson and Roger Sugden, ICCRA. Aerial photograph © 2006 by Travis McQueen, Manager, Huntingburg Airport. On Sunday, June 25th, wheat farmer David Ring was running his harvester into the last field. Suddenly he realized a big, flat circle was neatly laid down in his crop. He told me the plants “looked combed down in a swirl.” He and one of his farmhands got off the harvester and discovered there were also odd patterns coming off the big circle. One looked like a backward F and the other was a straight line with two short lines coming off of it. 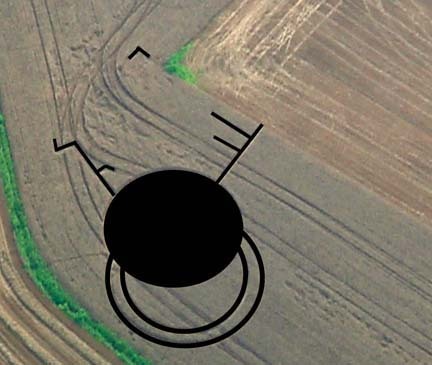 There were also two big loops coming off one side of the circle that looked a bit like their own tractor tramlines, but Mr. Ring knew he had not made the loops. The width of each of the loops, or three-quarter rings, varied from 1 foot 6 inches to 3 feet 8 inches. David Ring was puzzled. “It was my last field to harvest, I’m a farmer and I wanted to get as much of that wheat as I could.” He noticed that when he ran his harvester over the formation, most of the flattened circle wheat went into his machine. But the backward “F”, the other strange glyph and the double rings all seemed to be more tightly flattened to the ground and did not chop up into his harvester. He also noticed that where the rings and appendages came into the circle, the flattened plants angled right and left in a zigzag pattern. 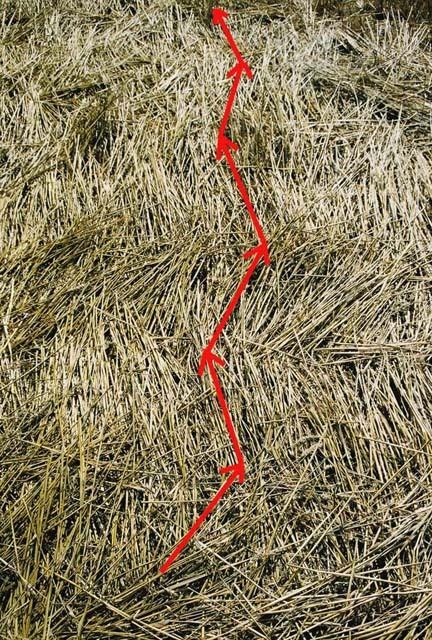 Zigzag lay of wheat in areas of the flattened wheat circle where the rings and appendages joined the circle. Photo and graphic overlay for clarity © 2006 by Jeffrey Wilson, ICCRA. That was Sunday, June 25th. The next morning, the manager of the local Huntingburg Airport flew over the wheat formation and took photographs. By Thursday, June 29, crop circle investigator Ted Robertson – with the Independent Crop Circle Researchers’ Association (ICCRA) – got to the field to take measurements and make a diagram. The next day, Jeffrey Wilson, Director of the ICCRA, along with other ICCRA field researchers Roger Sugden, Charles Lietzau, Ph.D., Delsey Wilson and Ted Robertson, met at the formation site to gather plant samples and measure the pattern with a new magnetometer, Broadband TriField EM Meter, Natural TriField EM meter, compass, and Gamma-Scout radiation detector. So far, the apical growth nodes in the collected wheat samples are statistically elongated, which means that some kind of complex energy interacted with the plants. Elongated growth nodes have been found in crop formations around the world for the past fifteen years and are not an anomaly that can be produced by hoaxers. Left to right: New magnetometer, Broadband TriField EM Meter, Natural TriField EM meter, compass, and Gamma-Scout near the center of the main circle. The circle center was marked with the red flag in upper right corner of this photo. Image © 2006 by ICCRA. Jeff Wilson, who has investigated dozens of crop formations in the United States over the past decade, told me that at first glance the pattern in the aerial photographs did not appear to be very sophisticated. 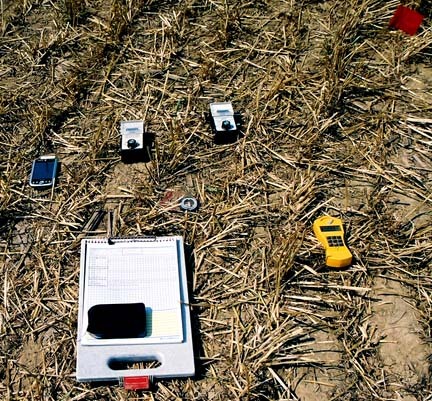 But when he and his team began to study what was left after the harvester, they found many fascinating anomalies – including one never seen in an American crop formation before. 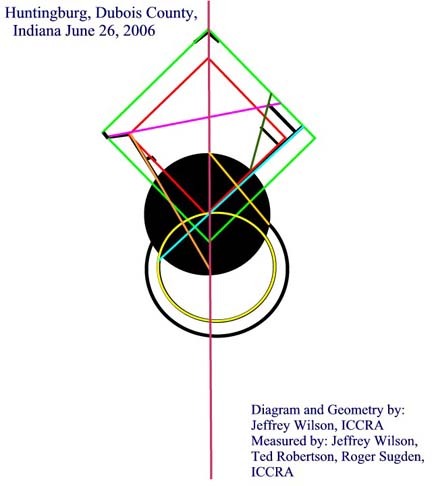 Jeffrey Wilson, Director, Independent Crop Circle Researchers Association (ICCRA), Williamsburg, Ohio: “Where the rings touch the circle on both sides of this formation, the flattening of the ring pathways flows into the circle on both sides. That was a real puzzle to us when we were first walking the perimeter of the circle because how can the rings both flow into the circle on both sides? It turned out that there is divergence in the flow from near the center point of the rings. It’s off the centerline a little bit. But the whole formation is laid out on a slope. Where this divergence occurred, the flow goes up the hill into the circle and the flow goes down the hill and into the circle – both ways, so it divides them back and forth. 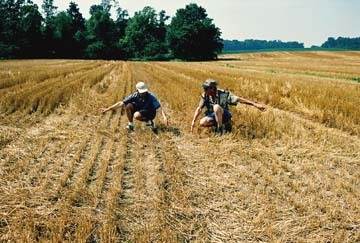 Ted Robertson and Roger Sugden, ICCRA, point in opposite directions from the point in the rings where the wheat went down in opposite directions and flowed onto the large flattened circle where the rings connected. Photograph © 2006 by Jeffrey Wilson, ICCRA. YOU FOUND THAT ‘HAIRLINE PART’ IN THE TWO-RING HANDLE. THEN YOU ALSO DISCOVERED ANOTHER LITTLE PIECE THAT SEEMS TO BE A KEYSTONE OR CENTER POINT THAT LINES UP WITH THE CIRCLE CENTER AND WHERE THE RINGS PART IN TWO DIRECTIONS? Yes, that is something we spotted on the aerial photograph. There is sort of to the north-northeast of the main body of the formation, there was an area of randomly downed, flattened wheat. In that section, there was a little L-shaped, kind of notch, or flattened area. That appears to be part of the geometry of the formation itself. That is like the keystone to unraveling how the rest of the geometry works inside the rest of the formation. So, that lies on that centerline that divides the part in the two rings, but also goes through the center point of the flattened circle and through this little keystone pathway. All the rest of the geometry flows and is connected to that point. HOW MANY TIMES IN AMERICAN FORMATIONS HAVE YOU FOUND SOMETHING LIKE A KEYSTONE SOME DISTANCE OUTSIDE OF A PATTERN? I would say I couldn’t think of a particular formation in which this occurred. The “corner angle” beyond the circle, backward “F” and “antenna” is the keystone to the pattern’s geometry. That keystone is right next to an actual Survey Marker standing nearby in the green grass, shown below. Graphic overlay © 2006 by Jeffrey Wilson, ICCRA. 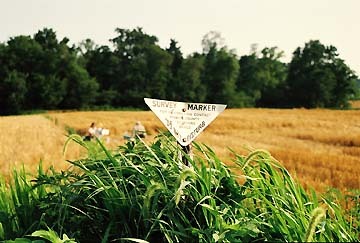 Survey marker in David Ring’s Huntingburg, Indiana, wheat field. Image © 2006 by Jeffrey Wilson, ICCRA. I CAN’T EITHER. THE ONLY ONE THAT REALLY COMES TO MIND IS THE ONE IN ENGLAND ABOUT THREE YEARS AGO WHERE THERE WAS A LAND SURVEY MARKER THAT WAS 200 OR 300 YEARS OLD. IT APPEARED TO BE A KEYSTONE FOR THAT FORMATION, BUT AGAIN IT WAS MANY METERS FROM THE MAIN FORMATION. EVERYTHING LINED UP AROUND THAT SURVEY MARKER. I would say that nearly every complex formation we’ve looked at has something unique and unusual that we’ve learned from. Although this one is unprecedented, it’s not unusual to find something new to discover and to learn from. It’s interesting, too, that you mention that other U. K. formation that had that survey marker as a keystone because right adjacent to this little keystone (in Indiana) is an actual survey marker, a geodesic survey marker, is in the field right at that corner point right next to it. THE FARMER FOUND THIS I BELIEVE ON JUNE 25TH AND THOUGHT IT MIGHT HAVE BEEN THERE LONGER. I UNDERSTAND THERE WAS A POWER FAILURE IN THAT AREA AROUND JUNE 22ND, THREE DAYS BEFORE, PERHAPS LINKED TO A THUNDERSTORM. BUT SOMETIMES POWER FAILURES HAVE BEEN LINKED TO TIMES WHEN CROP FORMATIONS OCCUR, AT LEAST IN ENGLAND AND SOME PLACES. That’s a good point. During the rain showers, the local neighborhood, the houses nearby including the house in which David Ring’s son and daughter-in-law lived, and the local airport which is adjacent to this field – all of those people reported NOT a power outage, but a voltage loss. The power dimmed dramatically, so much so that they said their light bulbs were just barely flickering on. They called and reported this to the power company, but it seemed to be fairly widespread within the immediate area surrounding the formation that there was this power dimming. It was not exactly a power outage. But power outages or power dimming do seem to be somewhat related to the times that crop circle formations are reported in a local area. A lot of people have reported this in the past. The area in which this occurred, there are not a whole lot of residential buildings nearby. It’s in a pretty rural area and it’s mostly farmland. I would say within visual distance, there are maybe three houses total. None of them are at all close to where this occurred. The formation itself is also about at least 400 feet from the closest road, but it’s also hidden by a bit of a rise. That’s the slope it’s on, on the backside of the slope from the road. No one could really see it from a vantage point of driving past. Even though it’s close to the airport, it’s in a place that’s perpendicular to the runways. So as planes are approaching the runways or taking off from the runways, they are not flying over this spot exactly. They are coming in at a completely different angle, so it didn’t surprise me that nobody from any of the airplanes had reported this before the farmer found it while harvesting. It’s also kind of shielded from the airport by a pretty tall grove of trees, so anybody flying low in or out of the runways would have blocked their vision also. 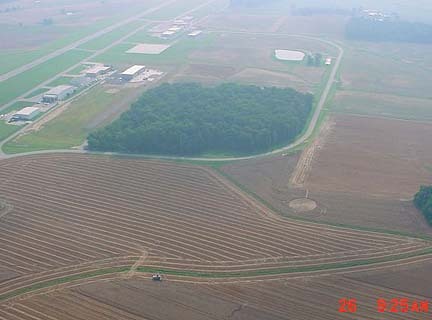 Huntingburg Airport separated from David Ring’s wheat field by thick grove of tall trees. Wheat pictograph close to green ditch near center of photo. Aerial photograph taken on June 26, 2006, © 2006 by Travis McQueen, Manager, Huntingburg Airport. THIS SEEMS TO UNDERSCORE THE QUESTION: WHY DO CROP FORMATIONS APPEAR WHERE THEY DO? 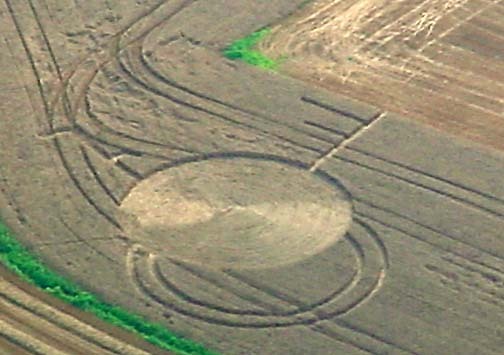 IN THIS CASE, IT MAY BE THAT THE MOUND QUESTION, THE ANCIENT HISTORY OF THE LAND, HAS MORE TO DO WITH WHY THIS SEEMINGLY SOMEWHAT HUMBLE, BUT QUITE FASCINATING PATTERN, WAS PLACED IN THIS MODERN WORLD AT SUCH A STRANGE SIDE OF A HILL NEAR AN AIRPORT 400 FEET FROM A ROAD. IT MIGHT NOT HAVE ANYTHING TO DO WITH THE MODERN TIME. IT MIGHT HAVE SOMETHING TO DO WITH ANCIENT LINE UPS? That could very well be because this particular area of southwestern Indiana is pretty full of ancient Native American mounds. We find that formations in the Midwest are coming down in the areas where the mounds are located. One of the interesting curious aspects that I uncovered as I was looking through the historical record to see what could be nearby in the county or outside of the county, there is a very large Mississippian city called Angel Mound, where there were several large pyramids near what is now Evansville, Indiana, which is about 40 miles to the southwest of where this crop circle location is. That city, and anywhere surrounding it for about 70 miles, is just filled with Native American mounds across this whole region. WHY WERE THEY CALLED ANGEL MOUNDS? Typically archaeologists when they discover and excavate a site name it after the current landowner. That was who the landowner was when the Angel Mounds were excavated in the 1920s. The family name was Angel, so they named the mounds after them. [ Editor’s Note: Wikipedia: “Angel Mounds State Historic Site is located on the Ohio River in Vanderburgh County, Indiana, adjacent to Evansville. It is part of the Indiana Department of Natural Resources, Division of Indiana State Museums and Historic Sites. It is one of 16 state museums and historic sites in Indiana and is listed as a National Historic Landmark. It is named after the Angel Family who settled in this location along the Ohio River in the early 1800s. 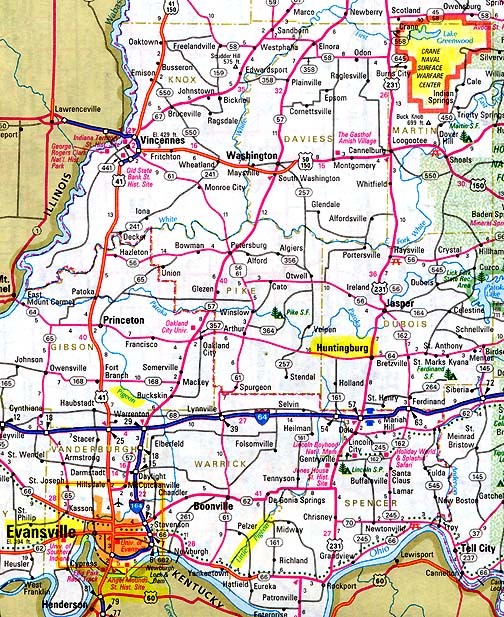 “For over a thousand years, Southwestern Indiana was home to many Native Americans. Today, Angel Mounds State Historic Site is nationally recognized as one of the best preserved prehistoric Native American sites in the United States. From 1100 to 1450 A. D., a town on this site was home to people of the Middle Mississippian culture, who engaged in hunting and farming on the rich bottom lands of the Ohio River. Because Angel Mounds was the home of a chief, it was the regional center of a large community that grew outward from it for many miles. There is a school of thought in which the earth mounds might have been placed in certain locations because there were magnetic, or electromagnetic, anomalies in those particular areas that the Native Americans could sense. There is also a second line of thought that in centuries past, the dominant species of animal in North America and around the world was the passenger pigeon. There were literally billions of passenger pigeons and they would migrate in flocks of up to 60 miles long and black out the sun as they flew on their migratory pattern. Unfortunately, the passenger pigeon is now an extinct species – hunted to extinction by man. They went from being the most populous, dominant species on this continent to being extinct within one generation. They seemed to fly along certain migratory routes in which we find all of the major geometric earthworks in the Midwest. There seems to be a relationship between where the geometric earthworks were placed and the migratory patterns of the birds that were flying at the same time. WHICH WOULD TIE IN PROBABLY TO THE MAGNETIC LINES OF THE EARTH? Right. There have been recent studies that show that migratory birds do follow the magnetic field lines. They seem to have an ability that actually allows them to SEE the magnetic field lines of the planet. If they could see the magnetic field lines, they could see where the anomalies were. Then you could see where the birds were spiraling around above the magnetic anomalies wherever they occurred, wherever the spirals or eddies of the magnetic fields would occur. Well, it turns out that in the case of this Huntingburg, Indiana, crop circle formation, this formation falls along one of these migratory patterns. In fact, if you go just a little bit to the south, southwest of where this formation occurred, that township is called Pigeon Township. It was named that because that was one of the spawning places of the passenger pigeon. If you continue farther south, southwest, you hit the Pigeon River, in which that water way was one of the major spawning grounds for the passenger pigeon. There is also the Little Pigeon Creek nearby there. Jeff Wilson is still analyzing his magnetometer readings and the results, along with any other new data, will be added as an update to this Earthfiles report when available. Huntingburg, Indiana, near center of earth mound map. Graphic © 2006 by Jeffrey Wilson, ICCRA. The geometry of the Huntingburg, Indiana, wheat pictogram © 2006 by Jeffrey Wilson, ICCRA. For further information about worldwide crop formations, please see reports below in the Earthfiles Archives and my book Mysterious Lights and Crop Circles in the Earthfiles Shop. 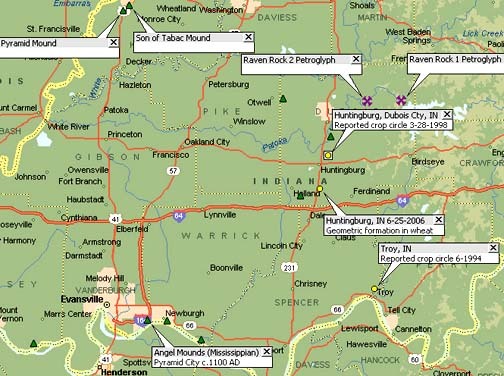 09/12/2003 — Second Soybean Crop Formation in Ohio – Special USAF Investigation Unit Involved? Next PostNext Updated: Area 29 – Reverse Engineering Center of E. T. Technology?